Much water runs while the miller sleeps. 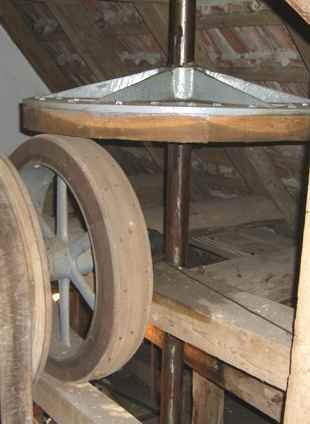 The bags' hoist or bag conveyor. With the bags' hoist the miller hoisted the heavy sacks full of grain into the mill (first floor), or lifted the flour bags from the ground floor up to the horse.drawn vehicle or the lorry in front of the mill. 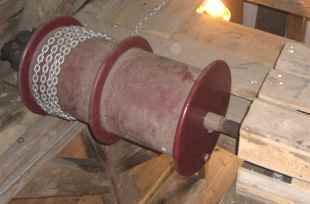 A long chain hangs down from the gable, and is put into operation by the power of the waterwheel transmitted by the frictional gear (see photo).